This unique text presents a thorough introduction to Mastercam Mill X for students with little or no prior experience. It can be used in virtually any educational setting -- from four-year engineering schools to community colleges and voc/tech schools to industrial training centers -- and will also serve as a reliable reference for on-the-job use or as a self-study manual. The award-winning authors have carefully arranged the contents in a clear and logical sequence and have used many hundreds of visuals instead of wordy explanations. 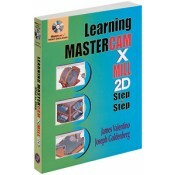 An enclosed CD contains Mastercam Mill X Demo and also includes examples and exercises from the text for student practice. Learning Mastercam Mill X Step by Step is sure to become a valuable resource for anyone learning or using Mastercam Mill X. • Student-friendly graphical displays are emphasized in lieu of long text and definitions. • Includes an overview of the process of generating a word address program. • Examples provide step-by-step instructions with graphical displays. • Eliminates flipping between pages by featuring all explanations on the same page as the example. • Contains exercises at the end of each chapter. • Features a process plan for many machining exercises to indicate the machining operations to be performed and the tools to be used. • The enclosed CD contains a student version of Mastercam Mill X. • The CD also contains the same examples used in the text so students can practice select exercises.